HAPPY NEW YEAR! – Bring on new projects. The new house looked exactly as it did in 1983 when they built it. Everything is oak, everything. The family who lived here before us, lived here for 20 years and did not upgrade anything. One area that sorely needed upgrading is the bathrooms. I have already completely redone the powder room on the main level because, let’s face it, that is the one that everyone will see and use when they visit. We have two full bathrooms on the second floor however and they have identical vanities with builder grade oak cabinets, white(ish) sinks, and not quite matching counters. 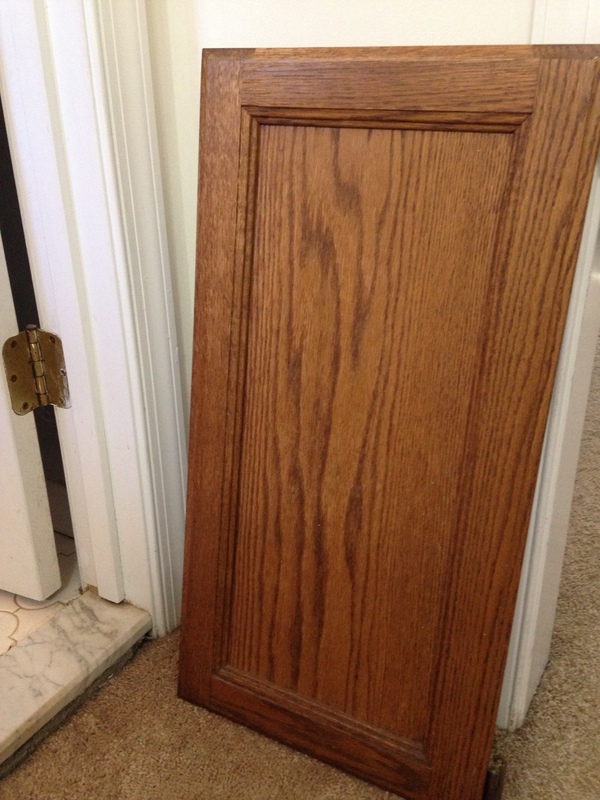 They also have oak 5 bulb light fixtures, and oak 3 mirror medicine cabinets. Those may be another post. (FYI – I hope not to offend anyone who likes oak, it’s just that none of mine looks very good and is quite worn and dated). 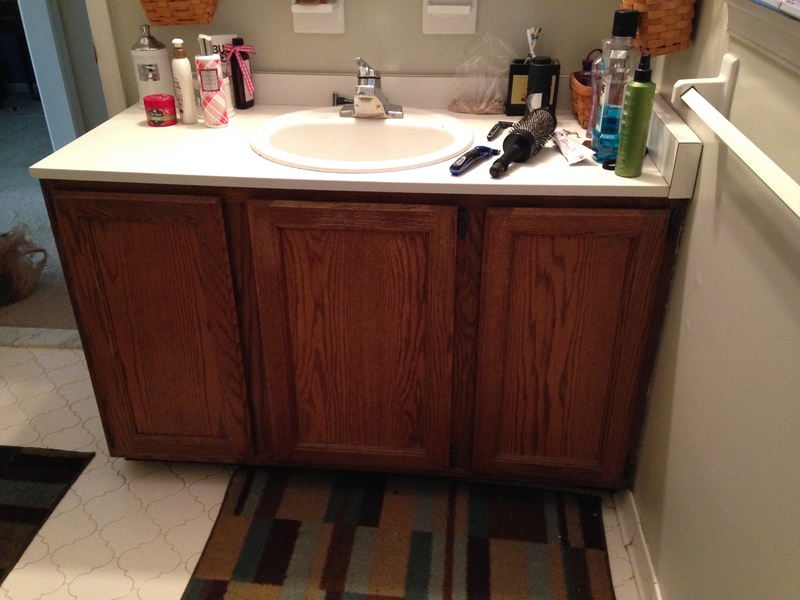 For this brief post, I just want to document painting the vanity cabinet in the master bathroom. It is a band-aid really as we hope to redesign the space someday. I just couldn’t take the oak anymore. This only took a few hours and then overnight to dry completely. Here is how it looked before painting. Here is a better picture of the ugly. 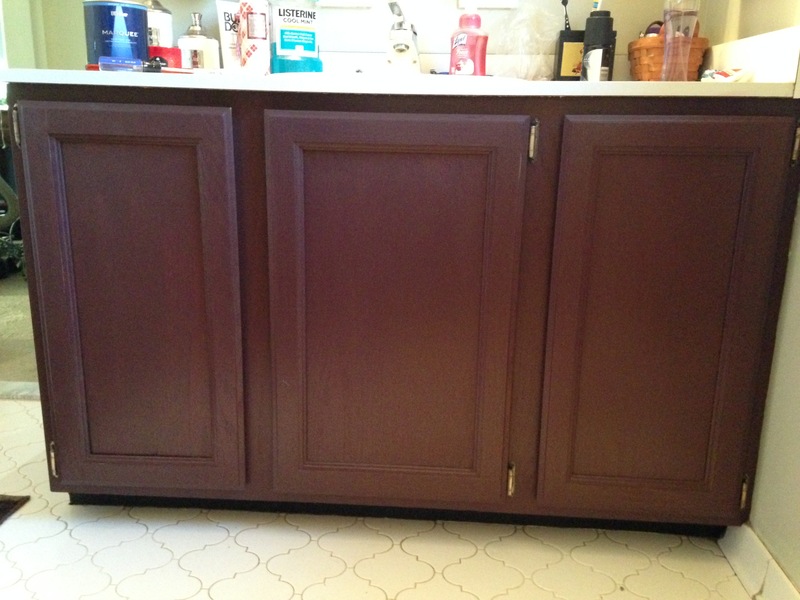 It is really simple to paint these cabinets. I chose a dark red color but any color will work. First remove the doors and sand down all the surfaces lightly with 180 grit sanding block or paper. Wipe everything down with a damp cloth after to get the sanding dust off. Then I used a 2″ bristle brush but any brush size will do. You don’t need a wide brush because you want to get into the corners pretty easily. Contrast between old and new color. 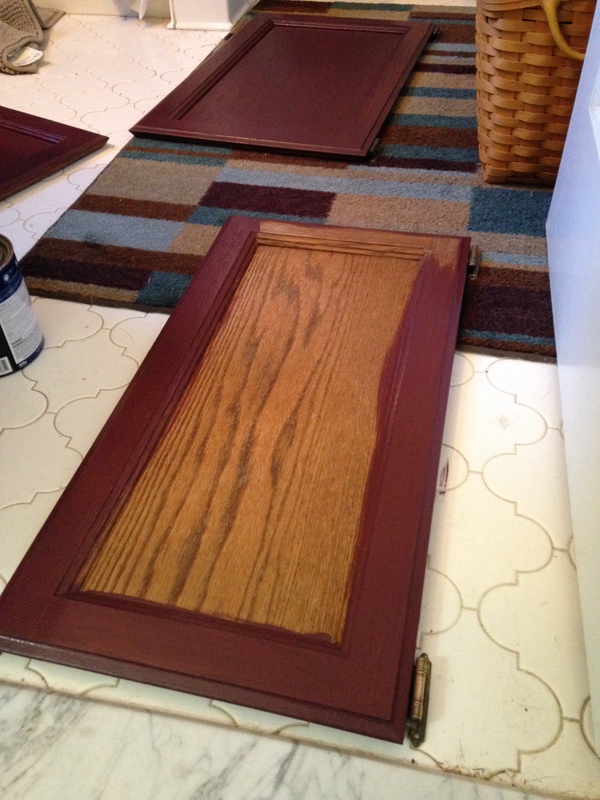 I applied two coats to all surfaces and I chose to paint both front and back of each door. I did not paint the inside of the cabinet. Once you have finished and let the paint dry 24 hours, you can attach the doors. Now is a great time to change out any hardware if you like. 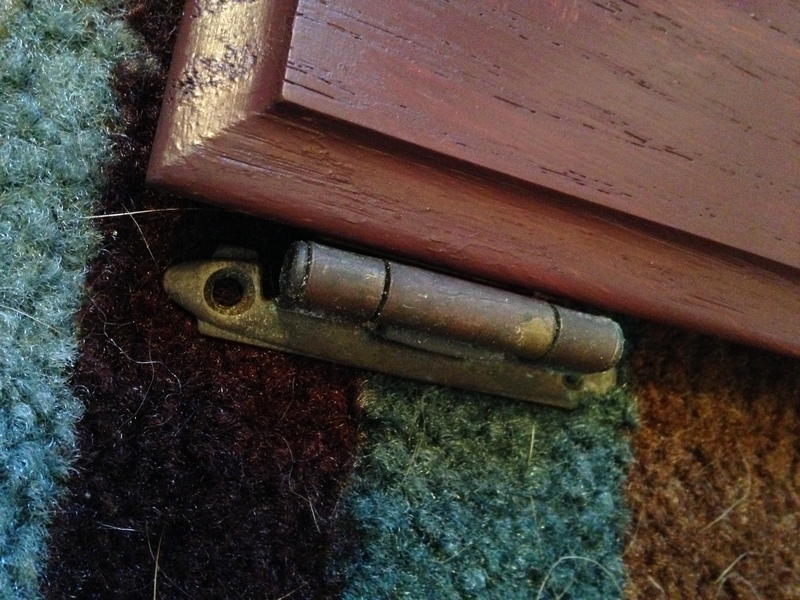 I chose not to but I did sand the hinges to brighten them without showing all the brass. 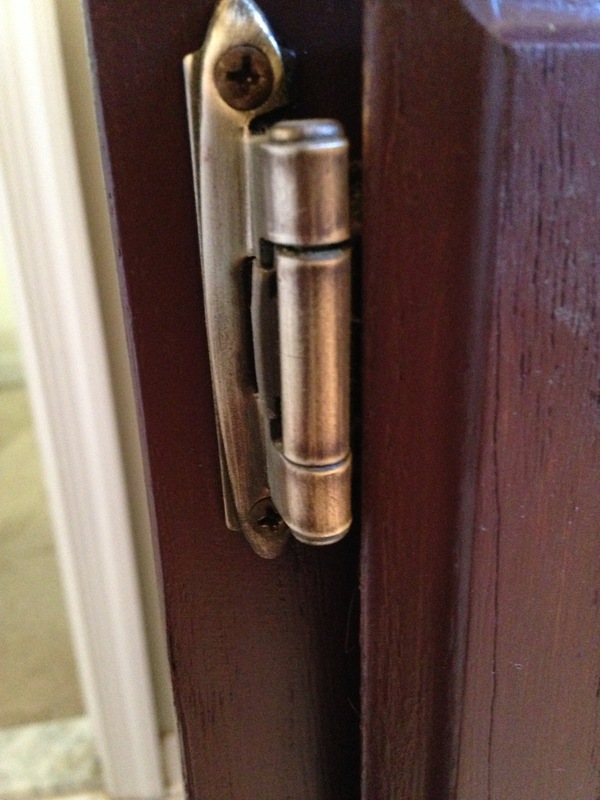 Hinges with old grime and tarnish. Hinges after being sanded with the same sanding block. 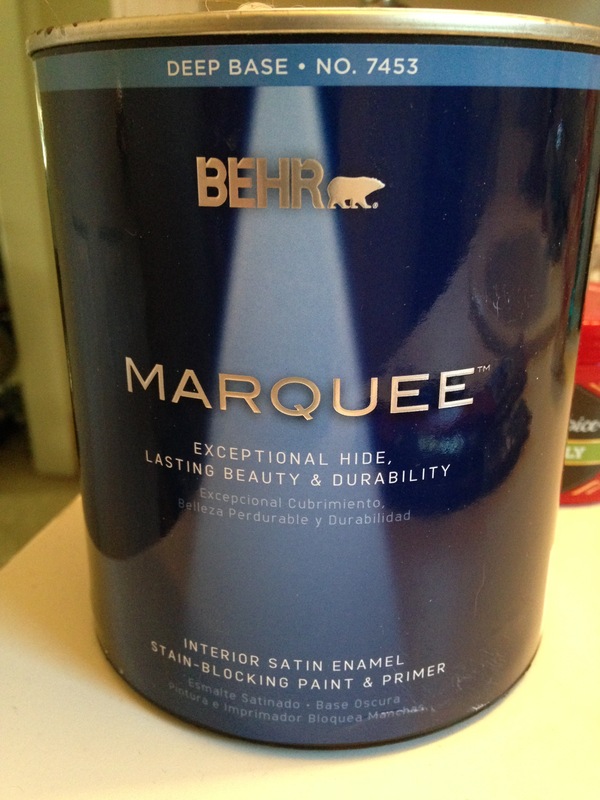 This is the paint I chose in satin finish. I barely used much of the quart. This is such a beautiful color- really creative choice for a bathroom!